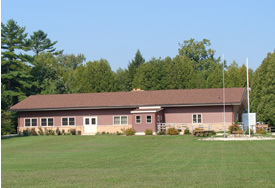 Rensink Lodge is the main lodge at Camp TaPaWingo. It can hold up to 150 people, making it the perfect place to hold gatherings for family, friends, weddings or organizations. A projection screen is available for slideshows, computer presentations or home movies! There’s plenty of room for eating, dancing, conducting meetings or simply mingling among your guests. Focus on your event or relax by the fireplace with friends and family while camp staff prepares and serves a delicious home-cooked meal. For current food service rates, please contact the camp office. You also have the option to use our full kitchen to bring and prepare your own meal(s). Within the lodge is a Great Room with a wood burning fireplace (with wood supplied by Camp TaPaWingo). Male and female dormitories are equipped with showers and restrooms each with a capacity of 24 adults (or up to 40 children under 12 years). The full kitchen is available which includes use of dishes and silverware, basic cookware, utensils, coffee maker, roasters, refrigerators, freezers, stove, ice machine and microwave. All parties are responsible for cleanup of the kitchen following the stay. Behind Rensink Lodge is a beautiful trail that follows the East Twin River that leads into the arboretum and pines. A large firepit area with log bleacher seating is also available for use by your group. Camp TaPaWingo will supply wood for your campfires, please do not bring your own. Daily use rate is for those not staying in the lodge during the same 24 hour period. $325 minimum (covers 25 people). $11 per person charge for groups exceeding 25 people on Fridays ad Saturdays. For use of the kitchen only. Includes kitchen equipment, appliances, dishes, silverware, and basic cookware. Looking for a smaller venue for your function? The Wagner Building may be what you’re looking for. It comfortably fits small groups, 30 or less, and can be used for many different kinds of occasions. 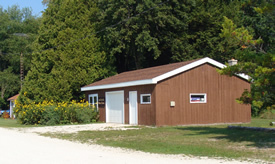 The Wagner building is located on the northwest side of Camp TaPaWingo, situated below a quaint pine forest. It is equipped with a small arts and craft kitchen, restrooms and showers. This makes it ideal for more active groups — those who prefer “doing” rather than just sitting. Do you need space for an arts & crafts class, a quilting circle or other group project? Look no further. Behind the Wagner Building is a small firepit area with benches. It’s a great area for telling ghost stories or to simply enjoy an evening with nature. Camp staff will supply you with firewood; please do not bring your own. Are you hosting a birthday party and want more room and less work at home? There’s easy access to the camp’s sledding hill which makes the Wagner Building a great setting for a child’s winter birthday party. The kitchen is equipped with a stove, refrigerator, and microwave. No kitchen equipment such as cookware, dishes, utensils, coffee maker, etc. is available, although you are welcome to bring your own. Hours of usage 8am-8pm. A kitchen is available in the building and it contains a refrigerator, stove, and microwave. No dishes or cookware are provided; please provide your own. Camp TaPaWingo has 10 small cabins on site, each sleeps 5 to 8 people. 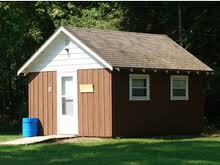 Cabins vary in size and occupancy. Bedding is not provided, please bring your own. The cabins have electricity, but are not heated and are not available late autumn through early spring due to chilly Wisconsin weather. While staying in the cabins, feel free to make use of either of the two firepit areas located at Camp TaPaWingo. Wood is supplied by the camp for campfires, please do not transport firewood to camp. Archery equipment and snow shoes are also available for a rental fee and deposit. 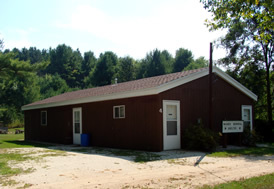 • Smoking is not allowed in any of the buildings at 4-H Camp TaPaWingo. Cigarette butts are to be disposed of properly. An additional maintenance fee for any additional cleaning due to the improper disposal of cigarette butts will be charged to the renter. Help us keep Camp TaPaWingo a beautiful place to stay! • Equipment is available with rentals. Please let us know if you require a TV, VCR or Black or Dry Erase Board. • Full terms and conditions are listed on the reservation form. *SECURITY DEPOSIT: $100 A security deposit of $100 is required for each day of your stay. Your deposit must be on file in order to reserve your date. If cleanup is neglected by a group there will be a $50 per hour charge for cleanup that will be deducted from the deposit. Damage or cleanup costs beyond the total deposit will be billed to and are the responsibility of the guest. Deposits will be refunded to guests when the inspection of the facilities by a staff member is complete and found in satisfactory condition. Your deposit is non-refundable if your reservation is cancelled within 60 days of your stay. Final payment for the reservation is due before your arrival at camp. EXCLUSIVE USE FEE: $100 Rent a portion of camp and be assured no other groups will use other areas of the camp during your visit. CLEAN-UP FEE: $50 / hour To be assessed if cleanup of buildings or grounds is neglected by your group. This includes improper disposal of cigarette butts.